The 2015 FEI European Pony Championships are taking place from Wednesday, August 5th to Sunday, August 9th 2015 in Malmo, Sweden. 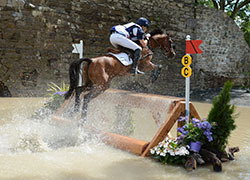 The Championships consists of the FEI European Pony Dressage, Eventing and Jumping Championships and GB sends teams to compete in each of the disciplines. The venue in Malmo is a more of a "pop up" site than the big permanent venues (eg Millstreet, Arezzo and Fontainebleau) of recent years. However, it is a lovely location, between the sea and the city with the XC running through a public park. As the venue for the 2013 Senior European Championships as well as an annual Horse Show (being held the week after the Pony Euros), there is a large permanent surfaced arena which is being used for all the events. Scarlett Charles, aged 14 from Alton, Hampshire with her father Peter’s 18 year-old grey gelding Aroldo (Verdi x unknown). 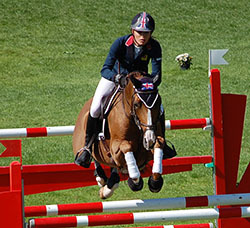 British-bred Aroldo competed in 2014 with Scarlett's older brother Harry and, as well as being in the 4th placed British team, they also placed 5th individually. Previously, Aroldo competed in the 2010 Pony Euros ridden by Emily Roe and in 2006 he was a member of Gold medal winning team with Emily's sister Rebecca. Jessica Hewitt, aged 16 from Pontefract, West Yorkshire with Lynn Barker’s 11 year-old British-bred dark bay gelding Ammanvalley Santino (Cruglwyd Sant x unknown). British-bred Ammanvalley Santino & Alex Gill competed at the 2013 Pony Euros as individuals and then in 2014 as members of the British Team. Jodie Hall McAteer, aged 15 from Borehamwood, Hertfordshire with Tixylix (Cavalier x Lauriston), a 17 year-old chestnut mare owned by Sarah Mendoza. Tixylix, winner of Team & Individual Gold with Zoe Adams in 2007 and regular team member with Jessica Mendoza from 2010 to 2012 (winning Team Gold in 2011 & 2012 and Individual Bronze in 2011), has been competed by Jodie since late 2012. Jack Whitaker, aged 13 from Whatton, Nottinghamshire with his father Michael’s 9 year-old chestnut mare Zodianne van de Doevenbree. NRPS (Zodiac x Khadiboj van Klaverborch). Dutch-bred and NRPS registered Zodianne and Jack have been competing internationally since April 2014. With Jodie, Jack & Charlotte were part of the winning nations Cup team in Hagen in June and Scarlett & Jessica being on experienced ponies, this team has a considerable amount of experience to draw on. The team will compete under the guidance of Youth Team Manager, Clare Whitaker and Pony Chef d’Equipe Matt Lanni. The Pony Jumping team are supported by the UK Sport National Lottery funded World Class Programme and official Equestrian Team GBR suppliers; Dodson and Horrell, Equi-Trek, Land Rover, NAF, NuuMed, Point Two Equine, Tagg Equestrian and Toggi. The teams are further supported by Animo UK, Champion Hats and Next. Saffron Cresswell (14) and her own 10 year old bay gelding Cuffesgrange Little Ric (unknown breeding). Making their debut at European Championship level they won the final trial at Barbury as well as being sixth in the Charles Owen National Pony Championships. Phoebe Locke (15) and her own 13 year old British-bred part-bred Connemara bay mare Quay (Kuwait Beach x Haddon Conquest). 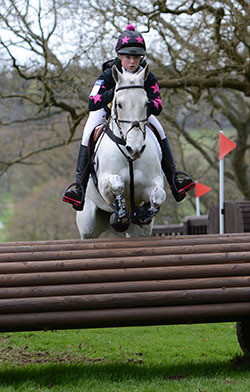 Phoebe with Mr Otto competed at the 2014 Pony Euros as individuals and placed 22nd. Phoebe Nicholson (16) and Hannah Mcleish's 15 year old British-bred WPCS Sec D chestnut gelding Llanstephan Brenin (Pennardd Annwfn x Synod Rascal). Phoebe & Brenin are also making their GB debut having consistently achieved a top ten place in every competition on the Pony programme in 2015. Jessica Thomas (15) and her own 12 year old grey gelding Another Island (Island Lad x Westside Mirah) and owned by rider. Jessica was second in the final trial at Barbury with her pony, who was previously competed in Pony Trials by Jamie Thomas. Thomas Tulloch (15) and his mother Jancis' 17 year old bay gelding Spirit VI (unknown breeding). Thomas and Spirit VI have won two successive British Pony Championship titles as well as being members of the 2014 SIlver medal winning team (and placing 12th overall). Harriet Wright (16) and her own 10 year old grey gelding Foxtown Cufflynx (Westside Mirah x Ashfield Hunters Jewel). This combination join GB as squad first timers following a successful 2015 campaign including a win at Withington Manor as well as finishing the final trial in seventh place. Connie Warde-Aldam (14) and her own 15 year old chestnut gelding Hotshots (unknown breeding). Hotshots is well known on the Pony circuit having been ridden by Sophie How then Annie Keir in recent years. This is the pair’s second season together with recent highlights including fifth place at Barbury. Isabel White (16) and her own 10 year old dun gelding Daydream Fourteen (unknown breeding). Isabel took on the ride in 2013 and recently finished in second place at the British Pony Championships at Brand Hall. Rebecca Bell (15) and Caroline Bell’s 12 year old bay mare Valido’s Sunshine (Valido x Marieton's Jasper) and with Caroline Bell’s 11 year old bay gelding Valido’s Starlight (Valido x Capri Moon) as direct reserve. Rebecca and "Sunny" were members of the 2014 Silver medal winning and 2013 Bronze medal winning teams. Phoebe Peters (16) and Tracy Peters’ brown gelding SL Lucci (Lukas x Bazar). Phoebe & Lucci were members of the 2014 Silver medal winning and 2013 Bronze medal winning teams as well as wining double Gold (Individual & Kur) in 2013 and Silver (Kur) in 2014. Liz Mills is Chef d’Equipe with Peter Storr as Team Trainer.